In Honor Of Design: A small tribute to one of the greatest men I will ever know. A small tribute to one of the greatest men I will ever know. You never have enough time with those you love. Even if they are 97 years old. 197 wouldn't have been enough. But God is the creator of life, and he alone can call us home. As I rushed to the hospital I drove through the small town where my life started, and where he built his. I drove past his favorite restaurant, Jerry's where he would go for birthdays and special Sundays.. I drove past his street where my grandparent's house stands... where many hours of meals were shared, long chats over grandma's iced tea on the front porch, endless summer bbq's with the best brisket you will ever taste, where fireworks would shoot off the back fence, where we gather around him and be serenaded in spanish by his sweet voice and hand made guitar, where we would bust pinatas over birthday celebrations, where he would slice the biggest slivers of watermelon I ever held and passed to all takers with a big grin on his face...I can almost taste it now. I never wanted those summers to end. I drove past the church of The Aunnunciation where he faithfully attended Mass, in the very front pew, for all the years they lived there. He never missed a Sunday. Where he humbly served his parish and all the parishioners through fish fries and the Holy Name service. To him, God was very real, and the most important thing in his life. Through this church, many of his children and grandchildren were wed and baptized lead by his example. He lived his faith through his actions. As I pulled up to the hospital, I had that sense of urgency to be with my parents and siblings who had already arrived, and I ran tears streaming down my face through the emergency doors. Was this really happening? Do we really have to say goodbye? It was hard to see so many loved ones with broken hearts, but we stood together surrounding the man we loved so much, and said our goodbyes. I held his hand just as I intended, and told him how thankful I was to him for being open to life and having my dad, the tenth child. I thanked him for the love he gave to each of his 64 grandchildren, and the legacy he left for us to live. I thanked him for being a loving husband to my grandmother for 72 years, and leaving us with the example of what a selfless spouse should be. When you are with someone who just passed from this earth and into the arms of the Creator, you can't help but want to go with him. My thirst for heaven has never been stronger. Rest in eternal bliss sweet Pepaw! We can't wait to hear your music again one day! "And with your final heartbeat kiss the world goodbye, then go in peace and laugh on glory's side. Fly to Jesus, Fly to Jesus, Fly to Jesus and live! "~ from Chris Rice's song "Come to Jesus"
A true love song to your Dear Pepaw. I offer my sincere condolences to you and your family Anna, may God bless you all during this time, and always. May the one who brings true peace, The Holy Spirit, fills your heart and the ones of your family. God bless you all. Beautiful Anna, I'm so sorry for your loss. It sounds like he lived a full, joy-filled, important life. God bless and your family. Sending love and good thoughts your way. Again, so sorry for your loss, but what a lovely post. I lost my grandfather 10 years ago and I still miss him daily. Your post reminds me a lot of him, though of course with many differences. I will continue to remember you family and particularly your saint of a grandfather in my thoughts and prayers. 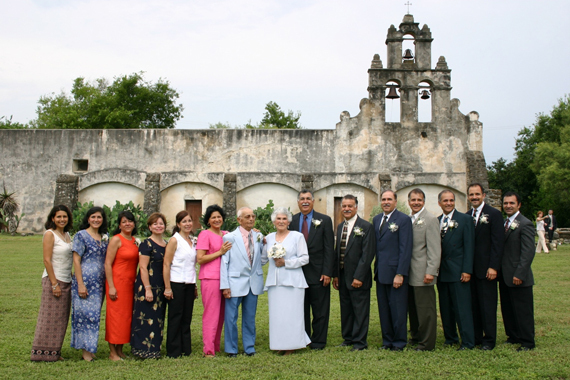 Quick question, was that 65th anniversary photo at the Missions in San Antonio? It looks so very familiar! so sorry to hear about your grandfather's passing. thank you for sharing the lovely pictures and the brave words. Oh anna praying for you and your entire family! Thank you for sharing such a personal experience..you spoke to my heart! Even though I never met him I am touched by his life.. his yes to having your dad meant that I got to have friendship with you and your amazing family.. I admire you so much for your love for God and your eyes of faith! What a sweet tribute to him. Glad for his memory! Love your blog. What a beautiful tribute to him. I am so sorry for your loss, but Im sure he is smiling down on you. You and your family are in my prayers. I'm sorry for yours and your family's loss. It sounds like he was a very loved and respected man. what lovely words anna, i'm so sorry to hear about the passing of your pepaw. some people truly leave lasting impressions on us, that will never fade, not even with time. big hugs to you and your family. I'm really sorry for your loss. This is such a beautiful post. It's truly a celebration of life and these photographs have captured these moments in his life so beautifully. Oh Anna, you are in my prayers. He sounds like an amazing man. What a blessing to your family to have had him as a patriarch! I'm so sorry to hear about your loss Anna, your Grandfather sounds like a truly amazing and incredible man. I'm sure he is in heaven looking down on this blog post and smiling at your kind words. Your family is in my thoughts and prayers! Anna, i couldn't have said it better. Every word brings flashbacks of those truly "magical summers". I love you dearly sweet cousin. How greatful I am to him to be given our family. do you remember "cocoa" (his dog) and he would sit in his chair and rub cocoa's back with the bottom of his shoe as he rocked? a little memory that i have engrained. I love love love you sweet sister. and i will greet you with tight squeezes tomorrow. So beautifully said...thank you for sharing. When my dad passed away, I was so comforted by the lyrics of "Homesick" by Mercy Me; that one day we will all be Home together. My prayers and thoughts are with your family. What a lovely tribute to your grandfather, so touching and heartfelt. I hope you find comfort in his love and all of those carrying on his legacy! Sending you lots of x's and o's. What a beautiful tribute Anna. The love you and your family have is so clear. My prayers and condolences go out to your family. It is so hard to miss someone so special but may you all rest in the knowledge that you will be reunited again, and in the wonderful kingdom of heaven, what a gift. Just read this post and got chills. What a beautiful tribute to your grandfather. I lost my grandma 6 months ago and understand the ache in your heart right now. I'm thinking and praying for you and your family during this difficult time. What a beautiful person he must have been! I hope that your family is continued to be be blessed by his life, even through grief. What a beautiful testimonial to the importance we can have on our family! The pictures are gorgeous too! I am so sorry to hear about this. It's hard to be separated from loved ones, but comforting to know they're resting in a better place. Hope you are taking care. What a sweet story. What a long a joyful life he was given to live! I have been to that church as a little girl. I use to always make my parents take me to all the missions and old churches. Anna, I am so sorry to hear about your sweet grandfathers passing, but you are such a shining and strong woman, knowing that God takes His hand in every matter and your faith in that is so uplifting! It sounds like your grandfather was one amazing influence! My prayers are with you and your family during this time of grieving. How fortunate we are to look ahead and be comforted knowing that we will one day see all of our loved ones in the heavenly places. wow. this is an amazing tribute. and very sweet. i pray peace and blessing for you and your family. Oh Anna, I'm so sorry. Losing people we love is so, so hard. I, unfortunately, lost my last remaining grandparent when I was 25 and still mourn her to this day. I'm so sorry, Anna. These photos are so beautiful. 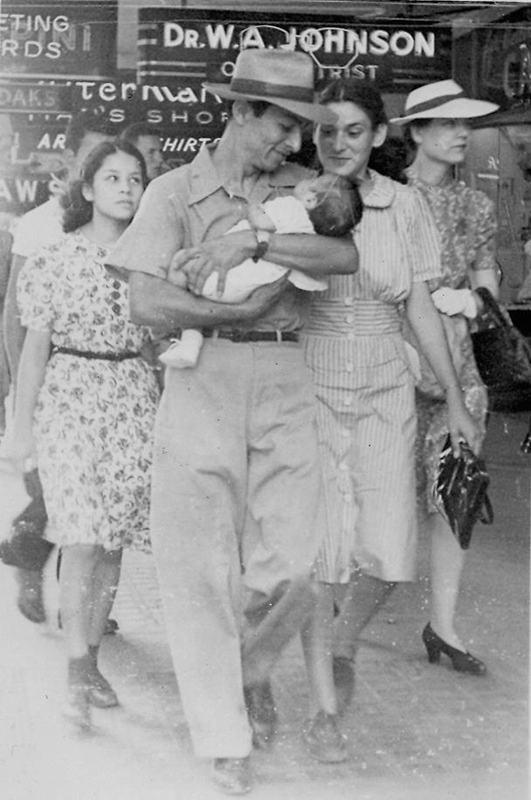 The one of your grandfather holding his baby and the look on your grandmother's face got me good. Hugs. Hi Anna, So sorry to hear of your loss. Your Grandfather sounds like an amazing man and what a beautiful family he created with your Grandmother. 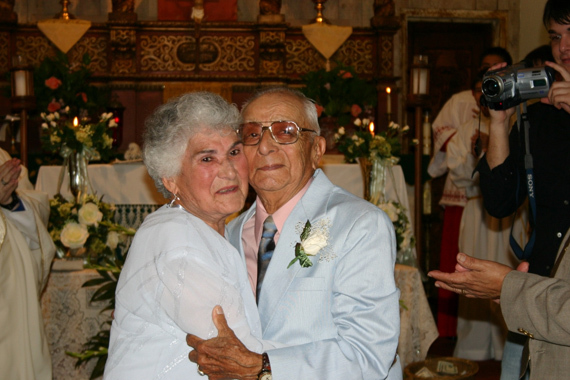 72 years of marriage, 15 children, 64 grandchildren, WHAT A LIFE! Thank you for sharing your story. Makes me think even harder about what Love is and means on this Valentines Day. Anna, I'm so sorry to hear about your loss. Your pepaw sounds like an amazing man. Such beautiful photos and a beautifully written tribute. Thinking about you and your family and sending lots of love and hugs! I'm sorry for your loss Anna. But I'm so glad you shared this with us. 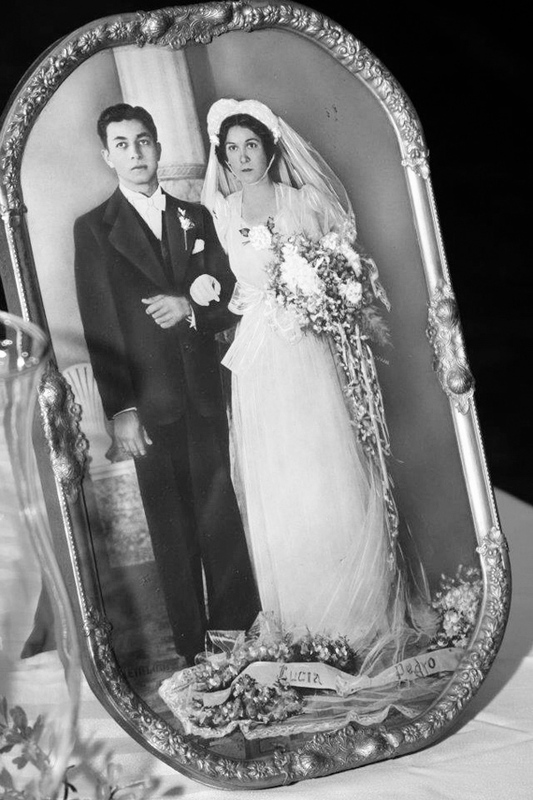 What beautiful pictures of your grandfather and grandmother! And what a personal tribute to the permanency of marriage and lifelong love! I'll send up a prayer right now for your grandfather and for your family. What a beautiful tribute to your grandfather. Grandparents mean so much and I look to their example over and over again. They are truly blessings. We miss you here in Kansas! The Eilert family says hello. Anna, what a beautiful entry. My heart feels for you and my thoughts and prayers are with you and your family. What an amazing post, Anna. So sorry to hear about your post, but conversely, I'm so glad that you have so many gorgeous and important memories to feed you. This was incredibly moving to read. What's important to focus on is the incredible family he's left. I'm sure he's very proud of you, all his children and grandchildren. Keep showing your intense love for your family and his spirit will live on, I'm sure. My deepest condolences. Take care of yourself and appreciate the things that can bring smiles and delight, as I'm sure you are. Anna, i was here earlier this morning and then had to leave for work. seeing this post and not being able (at that time) to send you my heart thoughts made me ache to come back now so i could send you love. your writing gave me internal sighs of understanding and empathy before and it does again now. your Pepaw would be honored to no end with this tribute to his stature in life. you know the 1st time i ever saw my Dad cry was when my Mom's Mom passed away. She was the 1st in our family to move on while I was alive so it was my 1st time seeing Dad's reaction. When you wrote about your Dad loosing his hero i about had to run into the bathroom for some moments alone. Anna, i'm so sorry your family has lost such an integral member, a triumphant spirit has risen though. He sounds like a wonderful man, I'm so sorry for your loss. Saying goodbye is so hard, I hope you feel a little closure by being near in the end. I was with my Grandpa when he passed. He was looking past my Grandma at something next to her. It was the most amazing thing, yet I still have a funny relationship with God. Despite those reservations and the memory, I'm happy I was there for him and even more for my Grandma.